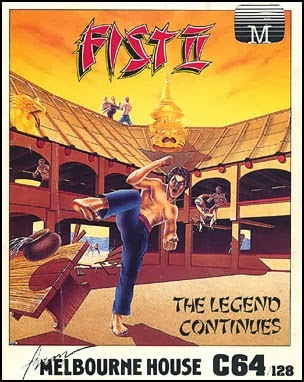 The first sequel to one of world's first properly good one-on-one beat'em-up games, The Way Of The Exploding Fist, was highly anticipated in its time. The surprise was great, when instead of getting more of the same in a new package, we were presented with another, completely different sort of a game to go with it. Actually, the Fist Tournament bit was the bonus to go with the actual game, which works well, if you didn't like what they had to offer. The actual game was a solo endeavour - a scrolling beat'em-up adventure of sorts, with a clear nod towards Jordan Mechner's similarly paced classic, Karateka from 1985. Initially, the critical response to Fist II: The Legend Continues was very much divided. Some critics seemed to hate it with a passion, and some seemed to think it an instant classic before giving it too much thought. Certainly, it was different enough, and a good way to make way into a new direction, but whether it's enough to make it a true classic is a different matter altogether. The game was only released on the C64 and Spectrum, although a conversion for the Amstrad CPC was in the works - it could still even exist, but so far it hasn't been found yet. 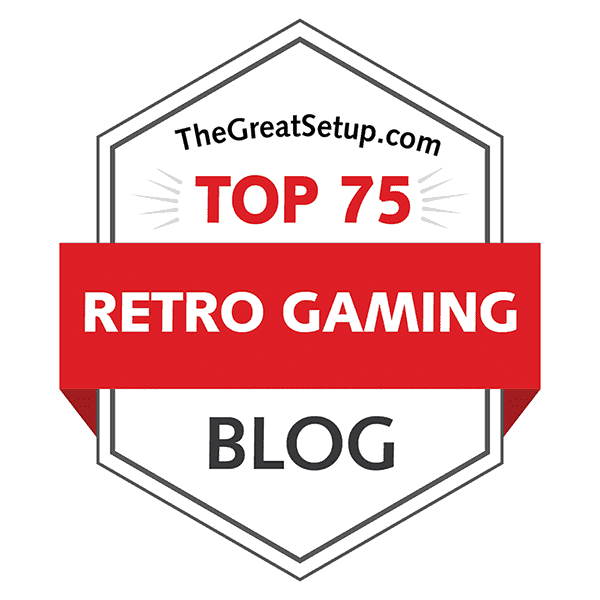 At the time of updating this entry for the blog, at Lemon64, 110 voters have rated it a respectable 7.7 and 70 World of Spectrum voters have given it a graceful 8.02. Let's see how they actually compare then. While Data East's Karate Champ from 1984 could be considered the one game to popularize, if not exactly establish, the one-on-one fighting game genre, Melbourne House's The Way Of The Exploding Fist from 1985 was the one that showed the world how it was supposed to be done properly. The control system boasted of 18 different movements, with vastly better animations than its earlier peer, and a unique bonus round where the player must knock out a charging bull with a single hit - a feat famously mastered by the karate expert Oyama Masutatsu. 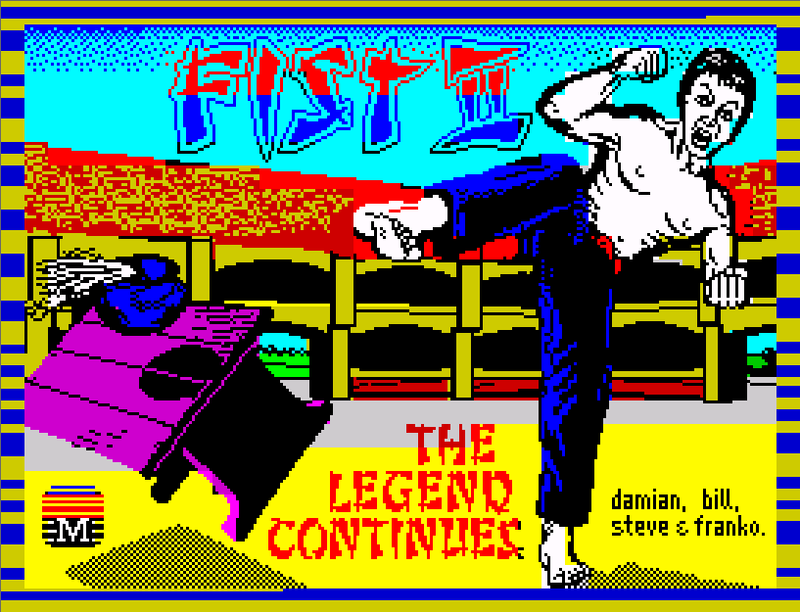 Although the original Exploding Fist game was a great hit for most of the machines it was released on, the developing team Beam Software decided to only make the sequel for three of the most popular computers at the time - C64, Spectrum and Amstrad. Unfortuntately, the Amstrad version's whereabouts are currently unknown, we have no idea whether or not it was ever actually released. Just as in the original, you have 18 movements in use, most of which are only useful when there is an enemy nearby. The main game is a side-scrolling action adventure, where your mission is to learn the ancient skills by delivering scrolls, which can be found scattered around the island, to different temples, where you must pray and achieve new skills, and finally enter the evil Warlord's dominion inside the volcano, and defeat him. The island features six types of enemies and other perils you will have to fight through in order to get to your goal. You will regain some strength back after losing some of it in a fight, by just walking or better yet, standing still. Praying in a temple will boost your strength back to it's full power. The main game is quite a long one for a single-loading game, as it takes close to two hours for even an experienced Fist II player to complete it. The Tournament game acts as a way to hone your skills in a similar manner to the original Exploding Fist game, but with an energy meter instead of hit points, and you can also play it head-to-head, which the fans of the first game will more likely enjoy. The first sequel to one of the most revered classic fighting games is certainly an interesting concept, and a fairly unused idea at the time. There are, however, some practical issues with the game mechanics, but it's only a slight adjustment to your playing style after having played the original Exploding Fist. It is a game definitely worth trying, but it is also an acquired taste that will take some chewing to get into it properly. I only own the Mastertronic Plus version of the Spectrum game and the original version of the C64 game, so I had to dig out most of the available tape images from the depths of internet. From what I could tell, C64's version 3 is most likely the Erbe release due to its length, and version 4 is the Mastertronic Plus release. For better information, ask the preservation team. As has so far been the tradition at my blog, the loading times will only be added as an optional score for the final overall scores. First things first - the controls. Your man walks forwards and backwards with left and right, and turns to face the other way by pushing the button and steering him backwards. Pushing the joystick up will make your man just enough to evade a sweep kick, and will also make him climb stairs upwards. Pulling down will make him either climb down or duck. Forward somersault can be performed by pushing the joystick diagonally up and backwards, and reverse somersault is similarly down and backwards, which can be confusing at first. Blocking moves will come semi-automatically when you retreat if your opponent is about to hit you. Since there are two block heights, you have to move the joystick diagonally up and down to change your blocking height. The offensive moves are as follows: high punch - diagonally up and forwards without fire button; jab - diagonally down and forwards without fire button; flying kick - fire and up; high kick - fire and diagonal up-forwards; back kick - fire and diagonal up-backwards; mid kick - fire and forwards; low kick - fire and diagonal down-forwards; sweep kick - fire and down; rear sweep - fire and diagonal down-backwards; roundhouse kick - fire and backwards. The kneeling punch, which is the true Exploding Fist punch, will be performed by pushing the joystick (diagonally) forward when crouched. Differences to the original Exploding Fist game become clearer as you progress in either the tournament mode or the adventure mode. When, for example, you happen to be walking through a watery passage, you are unable to make any movements that would require you to go underwater. Note that this new feature isn't converted for the Spectrum version. Also, you will be faced with random packs of panthers, which will leap at you, so the best way to deal with them is usually to duck. Initially, the most important thing is to win as many battles as possible, and meditate between battles in temples, because your maximum energy (Chi) level will increase through meditation, depending on the number of opponents you have defeated since your last meditation. The temples serve a greater purpose in the game as well - the success of your quest relies inevitably upon you obtaining the knowledge in the scrolls you will occasionally find on your path, so you must pick them up and take them to their designated temples, where you will learn the secrets of the scrolls. There are eight scrolls to collect and learn, all of which will help you in some pivotal way in your quest, be it an ability to pass through poisonous gas chambers or bring light into darkness or whatever. This is what takes the greatest amount of time in this game - finding the scrolls and where you should be taking them. Of course, in this day and age of knowledge, you can easily find such information on the internet, so you will not have to make any maps yourself. The thing is, though - both the Spectrum and Commodore versions have different maps, the former having the easier one to go through because of a less amount of elements and areas, which is not necessarily a bad thing. I was never all that good in this game, but now I found out it was probably more due to the fact that the original C64 version doesn't have a very good collision detection, so your fights will quite often end in your opponent shredding you to pieces, while you keep struggling to even get one hit through. The Spectrum version plays better in this regard, but only just. As if that weren't enough, the C64 version has a really annoying bug, which will effectively destroy any chance you might have of completing the game. Luckily, we do have some bugfixes around these days, but if you wanted to play it from the original tape, you would be screwed. The Spectrum version has no such problems, apparently. What makes the Spectrum version less interesting, though, and thus less playable, is the lack of variety in background graphics and secrets. It becomes unbelievably boring more quickly than the C64, even without the problems on the Commodore version mentioned above, so this is one of those cases where the graphics actually affect the playability in some way. Because of these missing elements and lack of overall content on the Spectrum, compared to the lack of polish and bug-hunting on the Commodore version, I have to give them a draw on this occasion. C64 - 1, SPE - 1. Familiarly to many of us, the Spectrum graphics are usually quite crisp and high in detail and quality, if lacking in colour due to the attribute clash phenomenon. Opposed to this, the Commodore 64 has usually a lot more colours on screen and better scrolling capabilities, but rarely all that high in detail because of the default graphics mode, which is lower in resolution. Tournament mode screenshots. Above: Commodore 64 / Below: ZX Spectrum. 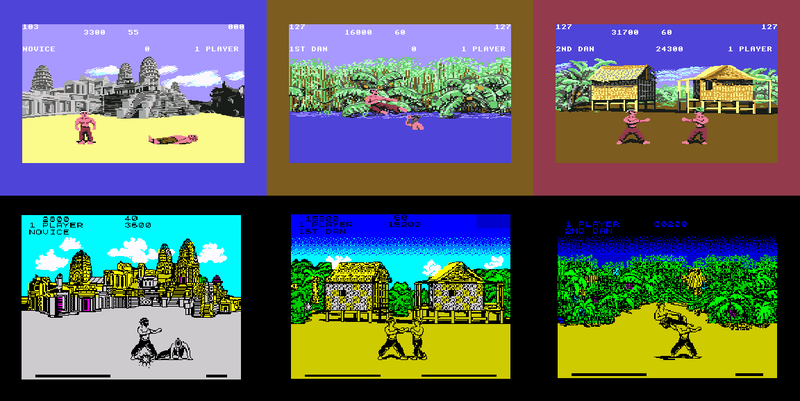 Compared to the C64 screens of the tournament mode, not only you will get some properly grey-scaled stone structures where grey stone is supposed to be, but the straw huts look like straw huts instead of being partly made of papier-mâché, and most particularly, the jungle screen places the two combatants in the middle of a river or some other watery sort of thing. I have no idea whether the Spectrum screen is supposed to have a hammock in the middle or what, the clash of colours make such an incomprehensible mess, but one thing I do prefer about it - the sky is darker and more ominous. 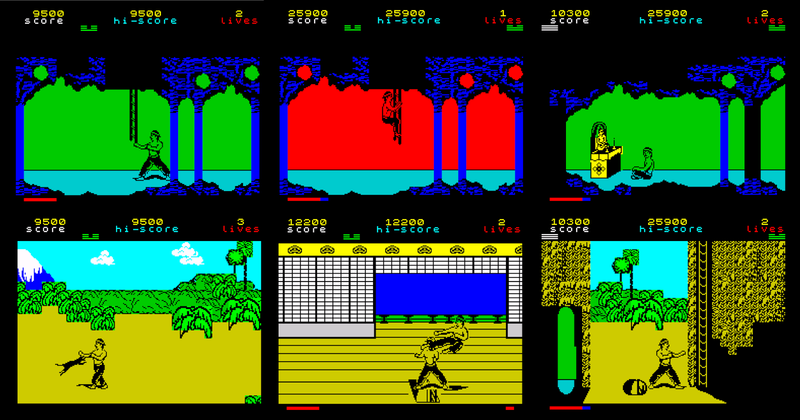 Screenshots from the ZX Spectrum main game (not re-scaled this time). As for the main game graphics, there are plenty of differences to pick out. The Spectrum version only seemed to have two types of caverns - green (safe) and red (poisonous). Also, all the houses look the same, and have no hidden passages from what I can tell. In the outside bits, you would mostly have only a yellow ground to stand on, with some green bits in the background (trees and bushes), and some yellow bamboo walls in very small bits, and then sometimes even some blue-and-white (or green-and-white) mountains would occur - all of these in very similar sets, as if they were sold by Ikea. Only the sky would be coloured either cyan or dark blue, but I didn't even notice that before I made the screenshot comparison collages. Screenshots from the Commodore 64 main game; cavern variations. The C64 version has at least 4 different colour variations in the caverns, with the temple areas having a unique pink/purple look to them. The poisonous gas chambers have a unique green flashing look to them - not at all cavern-like. All the houses look quite similar, but are at least very different in their layout - some have quite a lot of floors and kickable walls that reveal secrets. Depending on your location on the island, you will find yourself often in much darker dense forest-type places, and in contrast walking some mountain passages with very light colours and more strategically placed trees and whatnot. Some places even have a waterfall and vines and other unique things that make the island much more interesting and atmospheric to walk through than the Spectrum version. More screenshots from the Commodore 64 version; other areas. Finally, let's compare the character animations and scrolling. To be fair, the Spectrum version scrolls surprisingly quickly, even if it's handled in a character block-based method. Sometimes, it does create some strange movement bugs, when you get out of caves and walk in the wrong direction in a funny way, but nothing the game isn't unable to handle. The character animations are more fluent on the Spectrum - quite possibly due to the lack of other graphical elements, but this is also quite impressive, considering the first Exploding Fist game played a bit slower on the Spectrum. Here though, everything seems a bit slower on the C64 - scrolling, animations, fights, everything. But it still is very smooth for the most part, so I'm guessing the slower pacing is intentional. Again, due to having two very different focuses on each version, I am forced to have another tied score. Unsurprisingly, this is the easy bit. What is surprising is HOW easy this bit actually is. The Spectrum version only ever had a 48k release, so naturally, it only has some beeper sounds... of which there are two. A short hit effect and a longer hit effect, both of which sound like they could be samples of some sort of fighting yells. The main game lacks any sort of music, and the Tournament mode has a nicely energetic, single-channeled intro tune. Compared to that, the C64 version sounds very rich indeed. I came across four different sound samples for different kinds of hits and deaths, and I know there to be at least one or two other sound effects. In addition, you get three tunes for the main game - all of them at least somehow eastern, and two of them hauntingly ominous. The third one is rather peaceful, at least in a deceiving sort of way. In the Tournament mode, you will get two familiar tunes, both already in the first Exploding Fist game, and the sound effects are similarly more pronounced here, just as they were in the first Exploding Fist game. In short, there's really no contest here. The C64 has more sounds and more atmosphere created by the soundtrack. C64 - 1, SPE - 0. Perhaps I'm a bit surprised by how well the Spectrum version actually performed in the end, but the fact remains that the C64 version has an unmistakable atmosphere that really makes the game what it is. Varying sceneries, varying soundtrack - the secret ingredients to make this otherwise faulty game worth playing, and effectively, memorable. 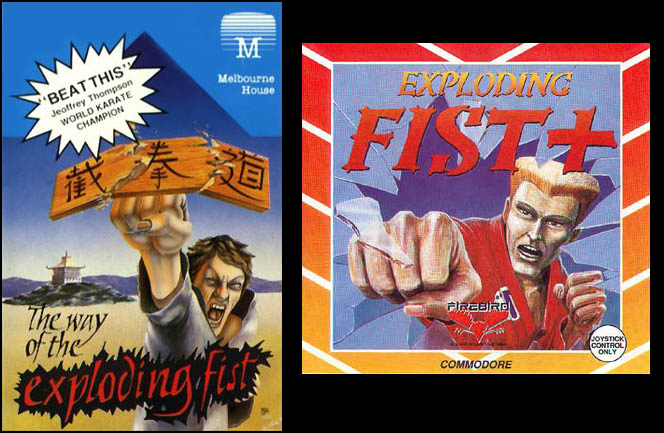 Be sure to take a look at the other two games in the series: the Way of the Exploding Fist, which acted as a mold for many one-on-one beat'em-up games for many years to come, and Fist +, the game that blatantly copied its worst opponent in turn - International Karate +. Thanks for reading again, see you next time! My two cents (basically what I already wrote on the WOS forum): I still prefer the Spectrum graphics of the tournament version - even by looking at the two screenshot you placed on the magazine, it is clear to me that the pagodas and buildings look more recognizable than the drab, grey blockiness of the C64 background. On the other hand, trees look more natural on the C64 main game (odd square palms in the Spectrum version), but the waterfalls and especially the vines of the C64 seem cheap wallpaper to me, even worse than the worst Ikea standards, and I find them nowhere near as atmospheric as you wrote. 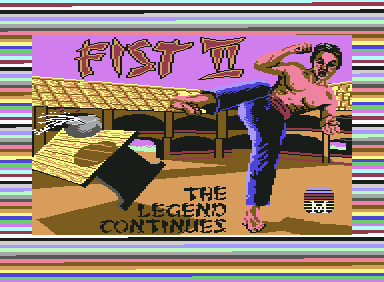 For the record, I played Fist II on real C64 hardware back in the day and what I appreciated most (credit where credit is due) was the background music, it really set the proper mood. Apart from that, I do not really see "loading" as having any impact on the actual quality of any game for any system for that matter, especially in the emulation era where any software for older platforms can be loaded in nanoseconds. In the end, I would have the Spectrum version to play over the C64 one, but that is rather a matter of personal preference due to being more accustomed to the former (which I even completed in 1989) than to the latter. I believe Fist II, like its predecessor, is a solid and enjoyable title on both platforms, notwithstanding the unavoidable differences between them. On a side note: could you please give more information on the bug of the C64 version and how to circumvent it? Bugs unfortunately happened even in those days - did anyone say "Jet Set Willy"? - and I would like to know more from your actual experience. I didn't choose the screenshots that was included in RESET magazine, and again, it's a matter of preference, whether you want slightly higher quality backgrounds that have very little variety, or more varied backgrounds with slightly less quality. I choose the latter. Anyway, the atmosphere has more to do with the music (you said it yourself) and the variety of backgrounds, both of which the Spectrum version clearly lacks. I have no problem with the graphics being blocky and drably coloured, when the Spectrum has a lot less graphics in the first place. Also, regarding loading, copied mostly from WOS forum: It isn't a suitable parameter for anything, really. I included it on the blog originally because so many petty-minded over-sentimental pre-1984-enthusiasts STILL like to think that some computer or other was superior because the loading times were better in whatever game. I'm trying to make a point here, that by having a proof of the actual loading times, it actually has very little to do with the end results, so they are only added in the end as an optional extra score for those who deem it somehow necessary. Personally, I think it's a load of crap, but for completeness' sake, I still do it occasionally. I remember buying this when it was released (should'a waited for the Zzap! review!) based on its excellent first game. I wish I had not bothered, I just found it completely glitchy and bug laden. To the point where what little enjoyment I could find in this poor game was leeched out entirely. I don't know how about the C64 version, but as for ZX Spectrum version, it was so covered in bugs that it seemed impossible to me to finish it properly. Incidentally, I am able to finish it with only 5 scrolls found and only 4 of them activated - at one point I just jump through a black "curtain" (which would otherwise drop me inside a gas chamber) and that gets me inside a pink chamber where I defeat "myself" - and - the end, congratulations. I never really found out if this was the correct game ending or how else should I finish it, because I was unable to find any other route to go (the gas chambers were impossible to cross for me throughout the whole game and I don't know it there was any way to get past them). Together with some baffling features/bugs (the first death in the second gas chamber restores your lifes to 4 for some reason; it was possible to jump through the ladders sometimes and get to an out-of-range area; a jump off of cliffs usually drops you into a completely illogical place; etc.) it was quite tough to even get to this point. Is there someone who actually collected and activated all the scrolls and finished the game (the ZX Spectrum version) properly? As far as I know, the gas chambers were supposed to be impassable until you had meditated upon one of the scrolls, as each of the scrolls would give you some sort of an ability or upgrade. The C64 version had at least one fatal bug, which would throw an endless army of enemies at you close to the end, as well as a few other, more inconsequential ones. There is a bugfixed version out there of the C64 version, though, which enables you to complete the game if you have the patience for it; don't know if anyone has made a similar bugfix for the Speccy version. I beat this game as a kid and it was lame. Beat up the guys hanging out in a volcano and then jump down to... death? I think?